SBTRKT’s gig on Monday at Lancaster library was nothing short of astounding, and I mean that in the most sincere sense possible. I had been sceptical about SBTRKT’s new direction, preferring his less vocally focused EPs, but he managed to inject new life into an album which I had been growing tired of, and since then I’ve been hooked on it. As soon as I was inside the library, I could tell that it was going to be a different kind of night – SBTRKT’s high profile had drawn a much younger and, let’s face it, ‘hipper’ crowd than usual, and the venue had opted for much trendier, more electro-driven pre-gig music than usual. The lights had already been dimmed, and SBTRKT had set up his distinctive gear onstage. And when SBTRKT and his vocalist Sampha arrived onstage and opened with the first song on his album that broke him into the big time, ‘Heatwave’, the crowd’s reaction was euphoric. The immediate reaction was to move to the music rather than just to be still and listen – and the atmosphere at the gig was such that dancing felt like the most natural thing in the world to be doing. I’m not much of a dancer, but it was impossible not to feel comfortable breaking out some moves in that room. The chopped up vocals that Sampha fed into the loops onstage, and the drum kit that SBTRKT used to augment the electronic beats on that first song showed just how good this pair are at working up a crowd. Just as a tune felt like it was about to drop into some eye-poppingly heavy bass, it would suddenly contort and shrink into something minimalist and delicate again, and start to build up to the next bit. Far from leaving the crowd unsatisfied, these little flourishes kept us hanging onto their every move, and drooling for the next drop. The beats alone were textured and gratifying enough to make the gig enjoyable, and SBTRKT’s drumming was a touch which added hugely to this element of the gig. 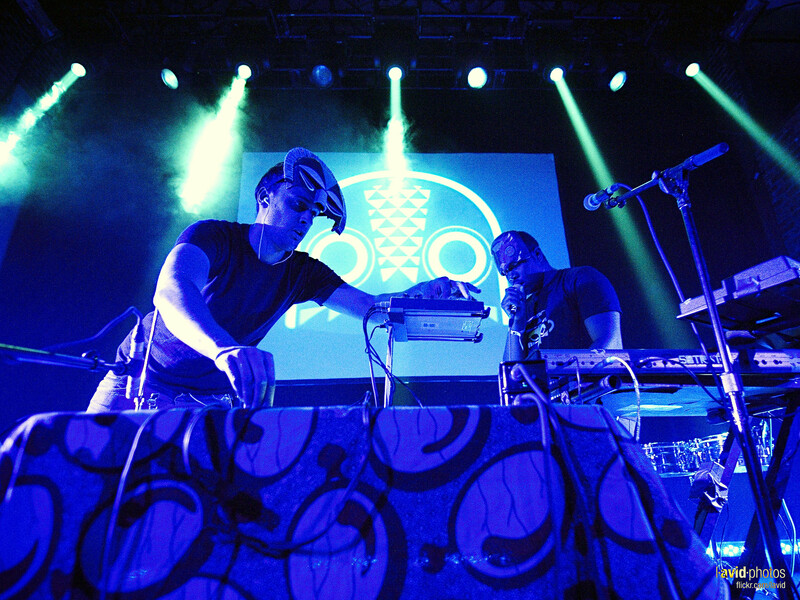 As they played through the album (with a few old gems, such as ‘Look at Stars’, a classic from the ‘Step in Shadows’ EP, one which had apparently been constantly requested but never played live before) each song would be started as it is on the album, and then expanded upon with additional beats and synths, and then SBTRKT would hop behind the drums and add a whole new dimension to the songs. He seemed quite a Meg White kind of drummer, and that’s no bad thing – he knew exactly the value of just one extra beat in a bar, and he used this to work the audience into a frenzy, albeit quite a civilised one. It was one of the only times that I’ve seen drums used to make a song sound wholly different, and it seems it’s only in this kind of music that drums and beats can be fully utilised and appreciated. Occasionally, when two sets of beats weren’t enough, Sampha would drop his vocal duties and do a kind of solo on some steel drums behind him. The encore included ‘Look at Stars’ and ended on ‘Never Never’, a melancholic song that swelled to a heartbreaking classic before our very eyes. Sampha’s vocals were one of the highlights of the night – he knew what he was doing up there, mixing vocals live and playing about on the keyboards. His and SBTRKT’s experience as old school London producers was clear – they were in a very different kind of space to the ones they would usually play, but they made the library feel more like a cramped basement in a cultish London club night than a place of scholarly learning way up in the godforsaken North. Definitely my second favourite gig ever.